An art form developed in the 16th century and an accomplished artist of the 21st century merge with excellence in Sandy’s work. 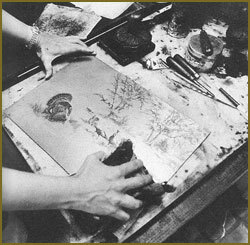 Etching was used by Rembrandt, Picasso, and Goya. The combination of this classic art form with Sandy’s creative and technical expertise provide the art public with quality etchings, each produced as an original work of art. ink. The prepared plate and a dampened paper are placed in a press and sandwiched between steel rollers under heavy pressure. The print is then pulled away from the plate. The etching is complete, ready to be signed water colored,, and numbered by the artist. Good etchings represent quality and collectability. The edge of the metal plate has left a mark clearly embossed around the paper’s edge. 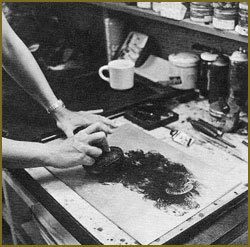 In pencil the signature of the artist, the title, print number and edition size of the etching will be found. 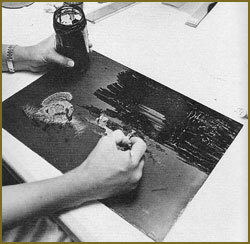 Etchings are fine art, original prints, which have a time honored meaning for the collector. Finally, look for pleasure in the etching, the subject should give you joy.